Marie Windsor was an American actress know as "The Queen of Bs" because of her frequent appearance in B-movies and film noir. She was born as Emily Marie Bertelsen in Marysvale, Utah, on December 11, 1919. She participated in dramatic productions while attending Brigham Young University. In 1939 she was queen of Covered Wagon Days in Salt Lake City, Utah. She worked in radio before she moved to California where she was first a model for glamor photographer Paul Hesse. In California, she entered the drama school of coach Maria Ouspenskaya. 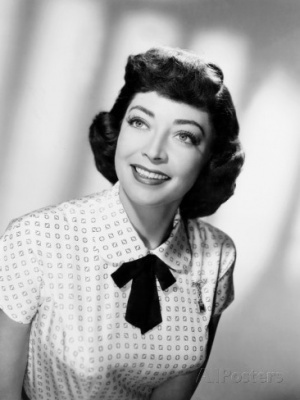 She appeared in the play "Forty Thousand Smiths" billed under the state name Marie Windsor. She appeared in other stage productions in California and New York. After working several years as a telephone operator as well as a radio and stage actress, she began to appear in main roles in films. She got her break after writing jokes and submitting them to Jack Benny under the name M. E. Windsor. When he met her in 1942, he was surprised by how attractive she was and insisted that a producer at Warner Brothers sign her to a contract. She then signed with Metro-Goldwn-Mayer, appeared in only two small roles, then signed with The Enterprise Studios in 1948. In 1948 she played opposite John Garfield in Force of Evil. In the 1950s she appeared in such films as The Sniper, The Narrow Margin, City That Never Sleeps, and The Killing. In 1954 she appeared opposite Randolph Scott in The Bounty Hunter. Some of her other films include Song of the Thin Man (1947), The Three Musketeers (1948), The Pirate (1948), Little Big Horn (1951), The Eddie Cantor Story (1953), Hell’s Half Acre (1954), Abbott and Costello Meet the Mummy (1955), The Girl in Black Stockings (1957), The Day Mars Invaded Earth (1963), Support Your Local Gunfighter (1971), and Freaky Friday (1976). Throughout the 1950s, ’60s, and ’70s she appeared in television roles in Maverick, Bat Masterson, Perry Mason, The Incredible Hulk, Rawhide, Bonanza, Lassie, Batman, General Hospital, Salem’s Lot, Charlie’s Angels, Lou Grant, Simon & Simon, and Murder, She Wrote. Her appearances in the ’80s and ’90s were less frequent. She played her final role in 1991 at the age of 72. Windsor has a star on the Vine Street section of the Hollywood Walk of Fame. In 1987, she received the Los Angeles Drama Critics Circle Award for best actress in The Bar Off Melrose. She was also honored with the Ralph Morgan award for her work on the Screen Actors Guild board of directors. She was briefly married in 1946 to bandleader Ted Steele. She later married realtor Jack Hupp, with whom she had one son. After she retired she became a painter and sculptor. She died on December 10, 2000, and is interred in her hometown, Marysvale. She was a member of The Church of Jesus Christ of Latter-day Saints. This page was last edited on 5 September 2016, at 16:09.